I knitted this sweater in no time. Even spun the yarn in no time. I just loved the pattern so much, the stitch pattern was easy and fun to knit, and the ever changing colors of the handspun singles just kept med going and going.. The yarns (because there are two yarns) are: Handspun singles, Noro-look-alike-yarn, spun pretty fast from carded wool/silk/alpaca-fibers in colorway “Delight”. The other yarn (the top of the sweater body and sleeves) is BFL-Steps, my handdyed sock yarn. The latter held double. The pattern I found in Noro Magazine #2. It’s called “Mesh banded pullover”. 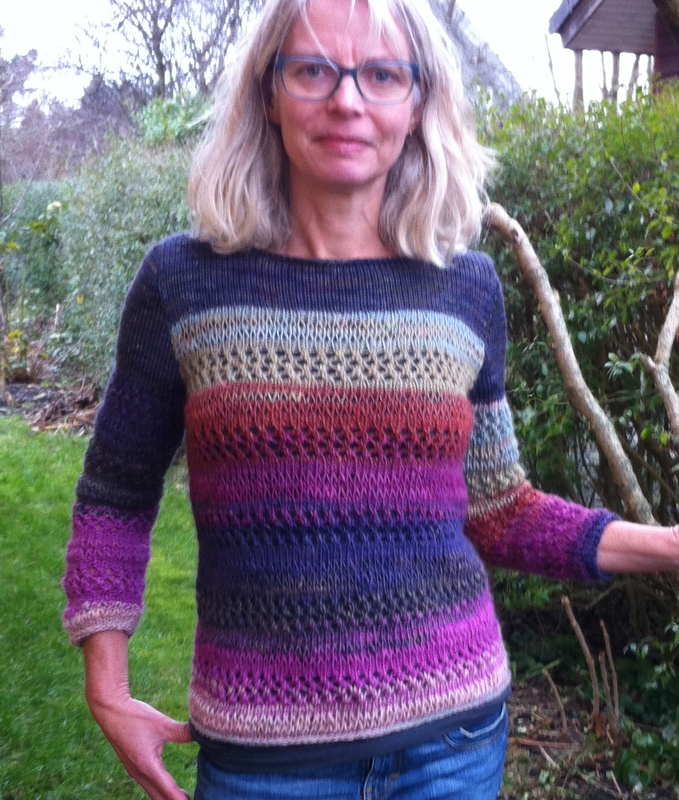 I am really happy with this garment. It fits perfectly and is not too hot to wear indoors. Love it! The first one is merino/silk yarn in both warp and weft. It is 170 cms long and 56 cms wide. Plus fringes, which are about 15 cms. Soft, shiny, with a nice heavy drape. It is extremely soft and luxourious. Dimensions: 56 cm x 180 cms, plus the fringe. 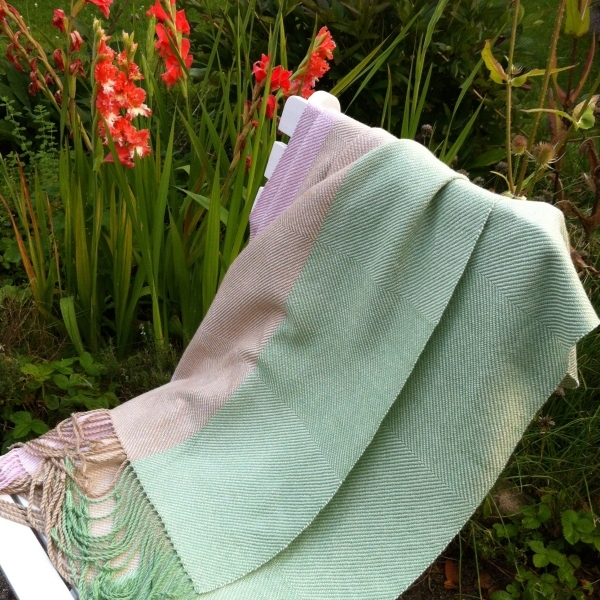 The handspun shawl while it was still on the loom. 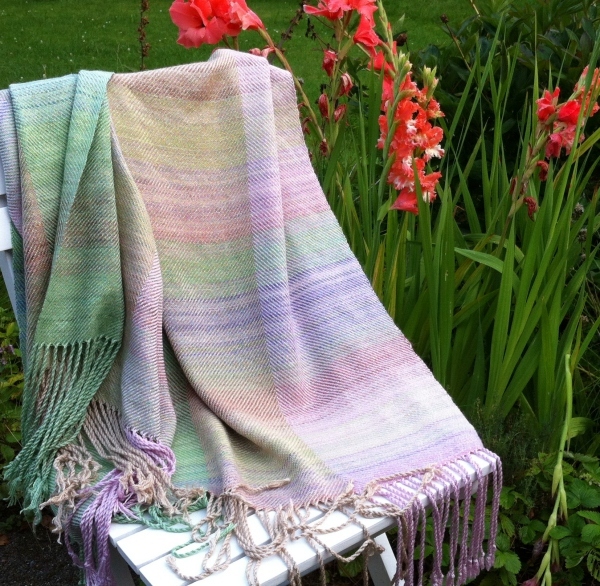 Both shawls are now in my webshop, together with lots and lots of fiber! 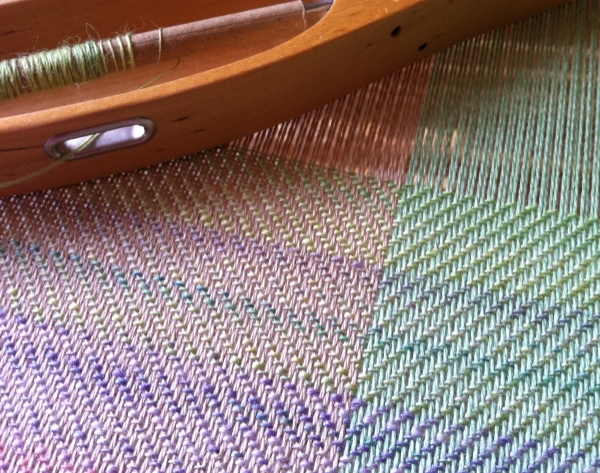 My loom is now standing naked, so I’m making plans for new weavings. With handspun. 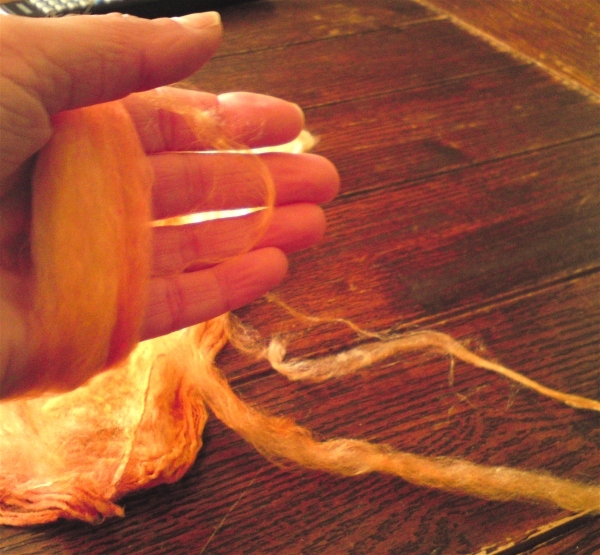 Silk Hankies are so easy to spin, and makes a beautiful, textured yarn. 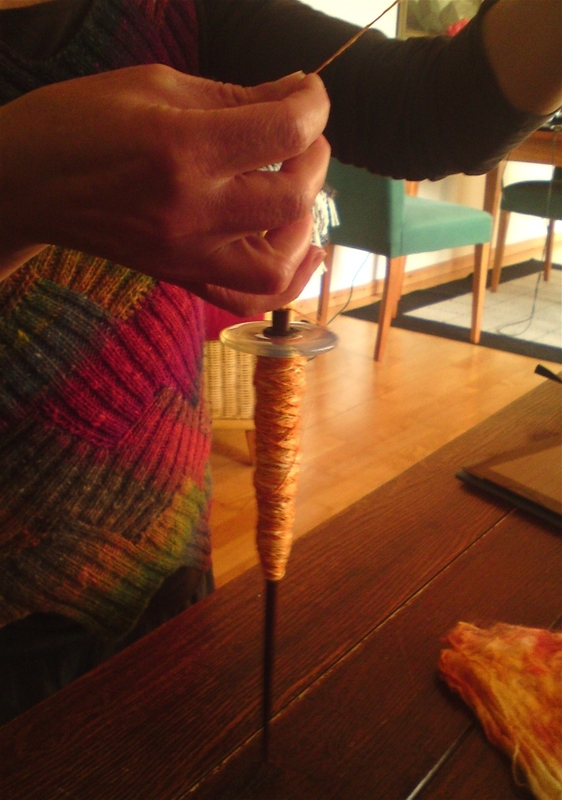 I will show the spinning done on a drop spindle, but a spinning wheel works equally fine. Silk Hankies are fiber squares (about the size of a hankerchief, hence the name) made up of many very thin layers of silk. 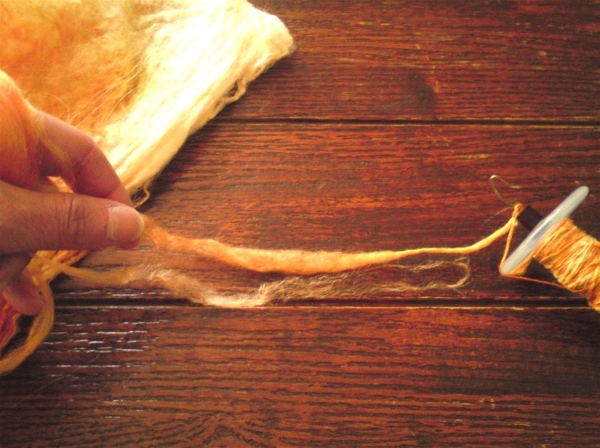 The silk from the cocoon is stretched over a frame to dry, layer by layer until it has a certain thickness. A typical Silk Hankie weighs about 5 – 10 grams. Use some handlotion to soften your hands before you begin working with the hankies, otherwise the fiber will stick to your hands and be difficult to control..
Peel off a very thin layer from the hankie. It’s like a spiders web. Poke a hole in the center of the thin layer. That turns it into a ring of fiber. Pull the ring gradually to thin down the fiber thickness. 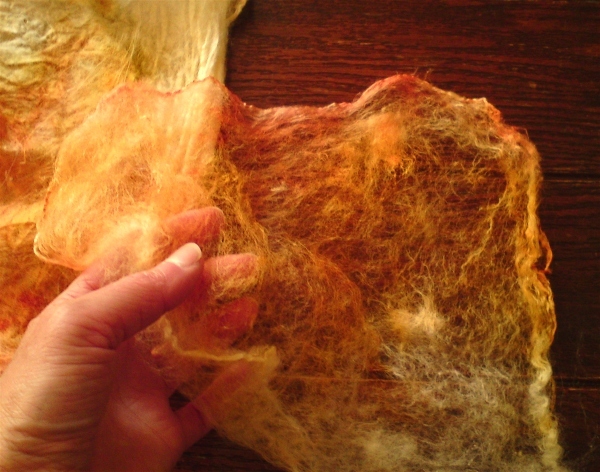 “Snap” the fibers a bit if they are difficult to draft, and make sure your hands are wide enough apart. 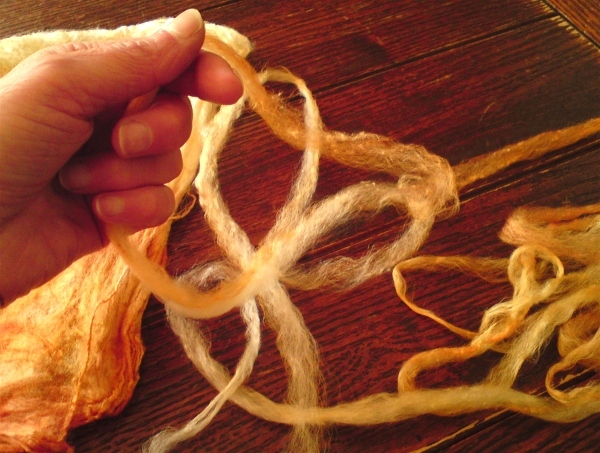 The silk fibers are very long and does not draft easily. You decide how thin you want the strip to be – it should correspond with the desired thickness of your thread. 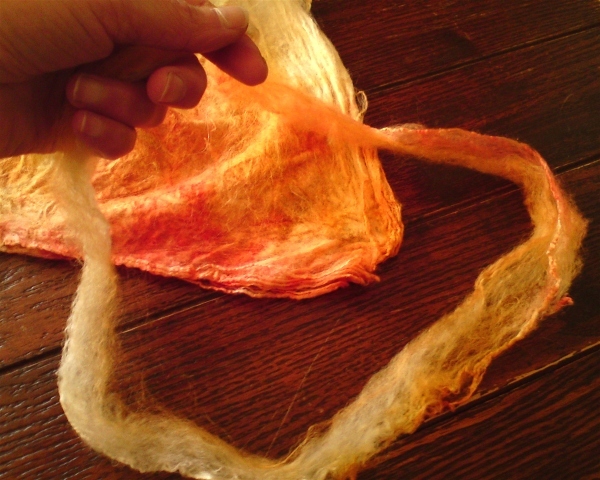 Then pull the ring apart and wrap the silk strip around your fiberholding hand (or make a small nest and set it aside). Now to spin it: Make sure you have a generous overlapping area. Minimum 10 cm (4 inches). While spinning there’s not much, if any, fiber drafting to do. Just add twist and maybe use your fingers to even out the irregular spots that, because of the textured nature of the fiber, will show up here and there. 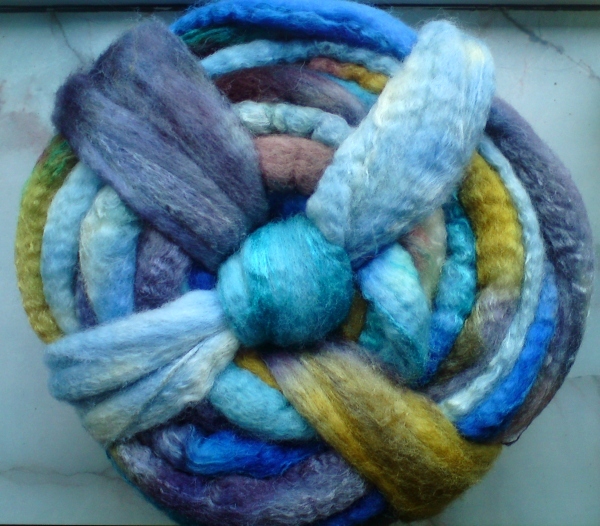 When I use the drop spindle I usually prepare and then spin 1 thin layer at the time. 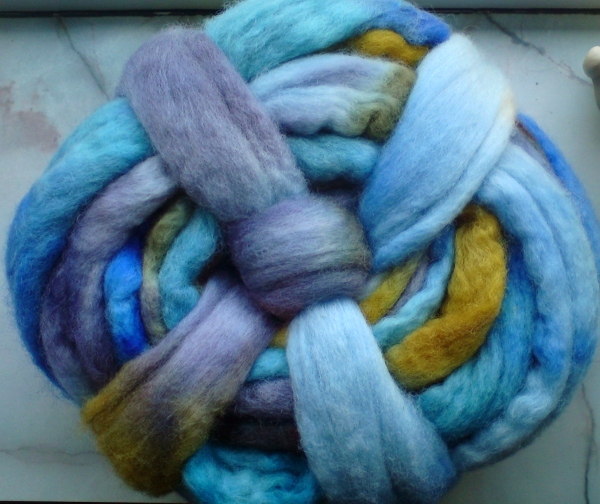 When using the spinning wheel it could be more practical to prepare several “nests” of fibers so you have a supply handy when you sit down to spin. 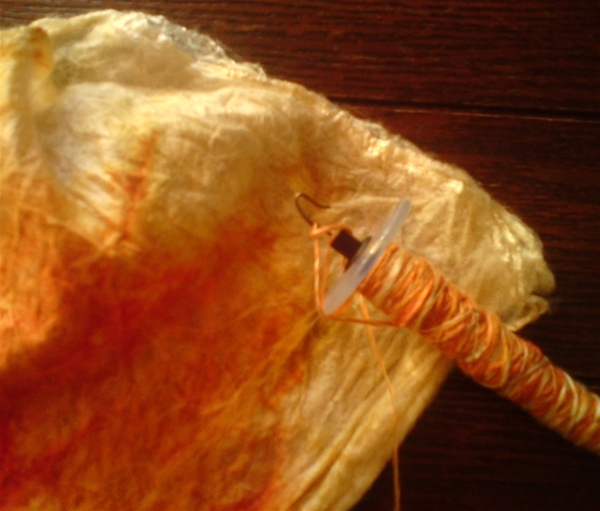 After spinning you can ply the thread, with itself or with something else. I’s also great as singles yarn. The long silk fibers doesn’t require much twist (or any twist for that matter) to hold together, and that makes it perfect for single ply yarns. I’m plying my silk, however. I’m using it for a modular knitted vest, that has been in my project bag for ages.. I’ll post pics of that some other time, so stay tuned for more! Silk Hankies are a joy to work with and the resulting yarn is beautiful, both shiny and textured at the same time. 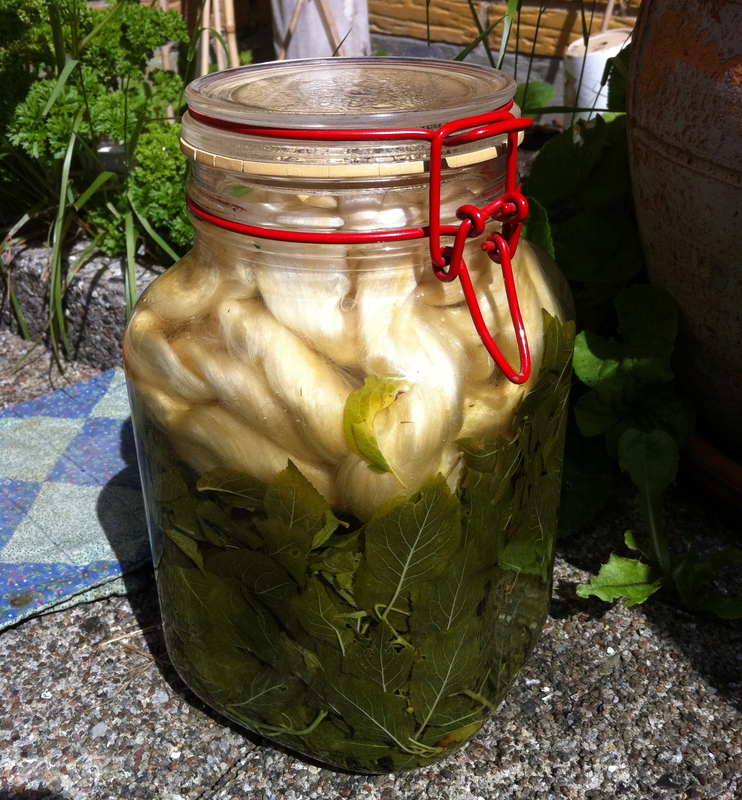 This shows my way of handling them – how do you spin yours?